NOW! With DRcaps™ capsules (digestive resistant) to help protect our ingredients from stomach acid. Now it has a new delivery system and in a Liqui-Krill™ capsule. A vegetarian capsule with unique properties that can slow down capsule opening after swallowing. 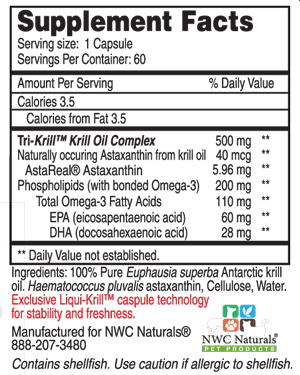 Tri-KRILL™ for pets - supplement is the king of all fatty acids food supplements. Tri-KRILL™ for pets - has 6mg of astaxanthin per capsule the highest of any other krill oil supplement. Tri-KRILL™ for pets - contains 24 times more astaxanthin than salmon. Tri-KRILL™ for pets - is FOUR times more potent than Fish Oil and therefore has four times the benefit! Too many Omega 6 fatty acids can cause many problems in our pets. Supplementing our pets’ diets with Omega 3 fatty acids will help to normalize this imbalance. Krill Oil absorbs quickly into the system, providing benefits such as agility and can help maintain a healthy heart, brain and nervous system, skin and coat. Krill oil contains a higher concentration of Omega 3 fatty acids, and also contains Astaxanthin, which is an added nutritional benefit. In addition, Krill Oil contains highly bioavailable EPA and DHA which can aid in cognitive function, and help fight inflammation. Because of the Astaxanthin in krill oil; this puts it to the top of the list of all omega-3 fatty acids sources. Unlike fish oil, krill oil doesn't cause fishy breath. Also, krill oil contains higher amounts of astaxanthin than fish oil. Visit Our new web site Krill oil for dogs. Antioxidants like astaxanthin disarm dangerous free radicals before they have a chance to damage proteins, fats, and the genetic material of cells. Tri-KRILL ™ sourced directly from the Antarctic; which combines the power of Krill Phospholipids with 6mg of astaxanthin per capsule. The highest of any krill supplement. EPA is highly unsaturated fat they contain 6 and 5 double bonds on their long structural chain. These polyunsaturated fats play a very important role with the function of our pets bodies. For this reason, krill oil can be seen as a category of omega-3 fatty acids unto itself. It is these additional attributes that have many customers now looking to krill oil as a value-added component of health for their pets. Give 1 capsule a day for pets weighing up to 60 pounds with food. Over 60 pounds give 2 capsules. For therapeutic results give 2 capsules a day. Can I break it in half? You cannot break it open with our new process it is seal for freshness. However, you can simply give your pet the capsules by placing it a treat. Keep in mind that the Liqui-Krill™ capsules are human grade supplements so they are very safe for pets. Tri-KRILL™ does not contain any ingredients that are harmful for pets or your whole family. Pet with allergies to seafood shouldn't use krill oil. Can I give Krill Oil to my pet if he/she is allergic to fish or shellfish? Absolutely not. Talk with your veterinarian if you suspect your pet is allergic to shellfish or fish. Some krill oil blends also contain some fish oil as a carrier, and fish can end up in the krill biomass as a by-catch. So, if your pet is allergic to any fish do not give him/her this product. You cannot break it open with our new process it is seal for freshness. However, you can simply give your pet the capsules by placing it in their food or it can be given separately as a treat. Keep in mind that the Liqui-Krill™ capsules are human grade supplements so they are very safe for pets. Tri-KRILL™ does not contain any ingredients that are harmful for pets or your whole family. Today, our pets are receiving more Omega 6 fatty acids in their diets than necessary. The cattle meat used in most pet foods contains an unnecessary amount of Omega 6 fatty acids because the cattle are now being fed grains instead of grass. Too many Omega 6 fatty acids can cause many problems in our pets. Supplementing our pets’ diets with Omega 3 fatty acids will help to normalize this imbalance. Krill Oil absorbs quickly into the system, providing benefits such as agility help maintain a healthy heart, brain and nervous system. Ask your veterinarian about how Krill Oil can benefit your pet!